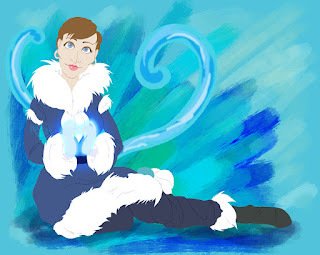 So this is a portrait of my exceptionally pretty friend Jessica Channer as a water bender! I took the reference from the Southern Water Tribe, but eh, specifics, I don't have them. You'll notice she's white, even though water benders from the South and North pole are not white. Can't say I really care all that much, haha. Next up I've got some more fire benders on the way as well as an earth bender- I stumbled in a bit over my head with the avatar drawings, and now everyone from work wants one too, haha. Ah well, it's nice to have ideas again. Here you go Jessica, hope you like it! I'm usually in bed by now.